If you haven’t visited already, we’d love to welcome you to the Tech Circle space. 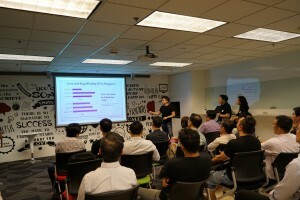 Although Tech Circle is a series of projects dedicated to growing Singapore as a hub (btw, we’re open to collaboration, connect with us here! ), we’re also happy to provide the space for anybody who needs it. We want Tech Circle to be that spot where people can work between meetings, host small events, or spend the whole day hacking away. So to make everything real simple and easy, let’s dig into the how and what of Tech Circle. 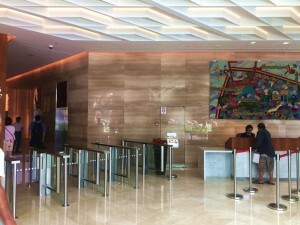 The Tech Circle space is in the Raffles City Tower. 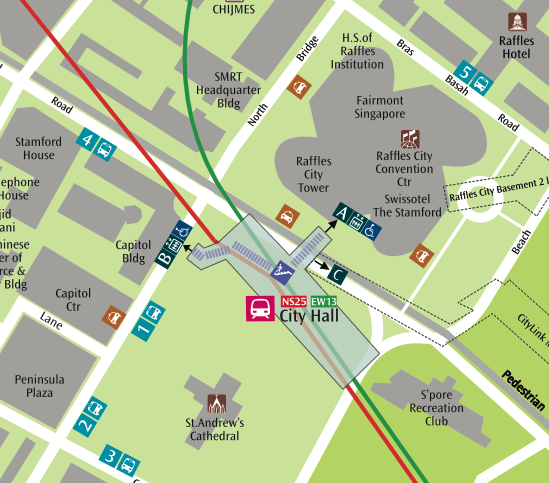 That’s right above the City Hall MRT, an ideal location if you’re having meetings in the city. In order to get in from the MRT, you’re going to have to go around to the office tower. 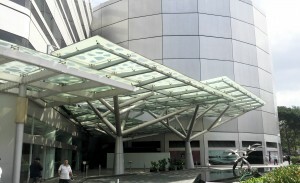 The visitor entrance is down the street from the taxi stand facing Chijmes on North Bridge Road. Head straight to the lobby reception and tell them you are a guest of Vertex. They will get your ID and issue you a temporary card. Take the card and scan it into the visitor gate and proceed to the 5th floor. Head to unit 05-03. There you’ll find the Tech Circle space. When you reach the space, you’ll be greeted with our state-of-the-art eye-scanning, fingerprint and biorecognition patented technology. Just kidding. It’s just some fancy startup software. Basically, the only way to get into the space is if you have registered here and have been approved. The approval will ask you to download th Gtriip app. The Gtriip app will bluetooth-connect to our mounted iPad and let you in. For iPhones, it will ask you for your fingerprint and for Androids, it will let you in right away. The space has 20 chairs, free high-speed wifi (password: ), tons of desk space and obviously air-conditioning. 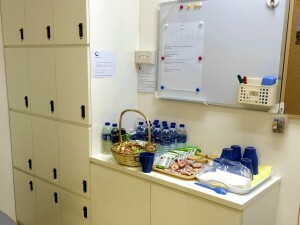 We’ve also got electronic lockers for your stuff and…that’s right…free condiments right next to them in case you need a recharge while you’re working. Of course, since our membership is over 700 people, as of this writing, and we only have about 20 seats, we have a booking system. If you’d like a seat at the space, make sure to book here. Besides booking a seat, we’re also happy when people book events. We especially love events that are for technopreneurs and for the larger startup community, so please keep that in mind when you’re thinking about booking an event here. Here’s the event booking form. So that’s the Tech Circle space in a nutshell. We hope you enjoy as much as we do, and we hope the little things we’re doing end up making a big impact, step by step.